This was an exciting year for sparkling wine category of Austria – better known as Sekt. The newly formed Sparkling Wine Committee of Austria was quite diligent and soon after their formation they announced the newest classification system for the quality wines of Austria. 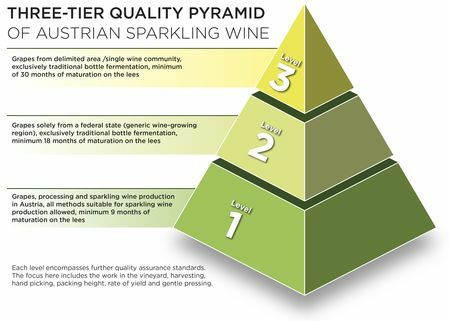 The three-tiered pyramid ensures that consumers understand what they are buying with regard to sparkling wine. Prior to the classification, the wines could be made from any method (i.e. traditional, charmat, etc.) with no official classification. The first level of the pyramid guarantees the grapes used in the base wines come form Austria and that it is aged for a minimum of 9 months on the lees. The second level guarantees use of the traditional method, as it used in Champagne, the grapes used for the base wines must come from one of our classified wine growing regions, and the wine must be rested on the lees for 18 months. The third level, the highest category, the wines must be made using the traditional method, all grapes must come from the same community (i.e. Gols, Langenlois, Gamlitz,etc.) with a designated vineyard. The wine must then rest on its lees for a minimum of 30 months and must be aged a minimum of three years, including lees aging, before being released onto the market. Want to ensure you are purchasing top tier Austrian wine? Look for the term: “Österreichischer Sekt” or “Austrian Sparkling Wine” as these wines are the only sparkling wins that guarantee they were made from 100% Austrian grapes. So there you have it! A fun fact to share with family and friends this holiday season as you sip and savor the delights of Austrian sekt! You know we’ll be sharing a glass with you! Prost!